Sam Arnold – three saved spot-kicks on a decent evening for The Cat. Khalsa won 7-6 on penalties. To say Khalsa were a trifle fortunate to come through this quarter-final against local rivals AFC Wulfrunians would be a huge understatement. A goal down with three minutes on the clock, Dave Meese popped up to head home a corner and breathe both hope and life into his side’s season. 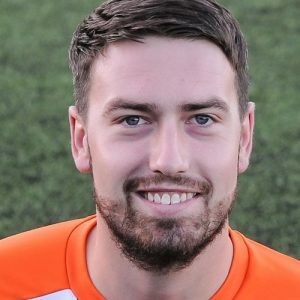 And then Sam Arnold – having already saved a penalty in normal play from Kyle Brady – then proceeded to save two more in the shoot-out to earn Khalsa an unlikely victory. Before that, there was plenty of action to be getting on with. Wulfrunians’ Jummaane Meggoe – full of running and energy all night – had two efforts in the first ten minutes, both of which were saved well by Arnold. His shot in less than 90 seconds was followed on ten minutes by an even better opportunity, both parried by the Khalsa keeper. Leon Miles had an opportunity for Khalsa on 19 minutes, volleying wide as the game began to swing back in the direction of the home side and then on 30 minutes Jay Holdcroft was sent tumbling in the box as a dangerous cross from Sean Williams ended up eluding everybody. Khalsa then struck the post twice in the space of a few minutes, first from Williams and then from Holdcroft as the home side finished the half with the upper hand. Jake Evans had a good chance just after the restart but again Arnold was equal to it before Meggoe again caused mayhem just afterwards, requiring emergency intervention by Carlo Franco to clear the danger. Liam Armstrong finished a tidy move involving Remi Birch, Alex Perry and Holdcroft with a shot lashed just wide on 59 minutes and Williams again chanced his arm on 63 minutes, drifting in from the flank past a couple of players before blazing an effort over. The deadlock was broken on 67 minutes. Brady looped an effort goal bound from a left-wing cross which was somehow scrambled out for a corner, possibly by a combination of the woodwork and Arnold. From that corner, an exquisite training ground routine saw the ball drilled into the box and turned home by George Taylor to give Wulfrunians the lead. Two minutes later and it looked to be going to pieces for Khalsa. Shawn Boothe was penalised for a foul in the box and up stepped Brady looking to double the lead. Arnold had other ideas, producing a great save to his right to keep his side’s hopes alive. On 76 minutes, Evans had another golden opportunity for Wulfrunians, bursting through on the break but putting his shot wide of the post. With the clock ticking down, it looked as if the visitors had done enough to secure the win and their place in the semi-finals. But Meese’s header in the 88 minute broke Wulfrunian hearts as they were left rueing their missed opportunities. The shootout saw Williams hit the woodwork with Khalsa’s first spot kick after Jake Webb had scored the first one. Evans and Khalsa substitute Liam Holt then scored to make it 2-1 to Wulfrunians before Brady again had his kick saved by Arnold. Meese, Holdcroft, Dan Westwood, Franco and Mensah Kinch then all duly tucked away their kicks for Khalsa alongside Wulfrunians’ Taylor, Angelo Franco, Chris Sterling and Conor Hughes. Then came Arnolds’ final bit of heroics to keep out the final spot kick before Armstrong stepped up to put Khalsa into the semi-finals. Sporting Khalsa: Sam Arnold, Carlo Franco (captain), Remi Birch (Liam Holt), Leon Miles, Shawn Boothe, Alex Perry (Mensah Kinch), Sean Williams, Dave Meese, Jay Holdcroft, Mykel Beckley (Dan Westwood), Liam Armstrong. Subs not used: Adam Osbourne, Tes Robinson.